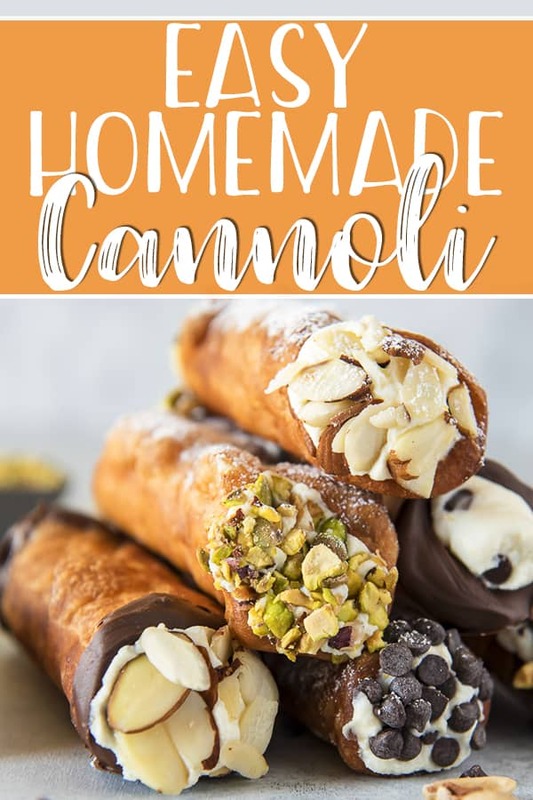 This homemade cannoli recipe is so easy to make, and the end results taste just as satisfying as one bought from an Italian bakery! The aromatic, crispy fried shells stuffed with creamy, sweetened ricotta cannoli filling will make even the most ordinary day special. The good news is, if you get it right, I can promise they’ll taste just as good! Maybe even better, since the satisfaction of checking something off your baking bucket list often tastes almost as good as the recipe itself. I’ve always wanted to make a homemade cannoli recipe, but the closest I’ve ever come was with my Cannoli Cupcakes. They hit the spot, but they’re definitely not the same. The first cannoli I ever tried was in New Jersey about 7 years ago. It came from a little bakery called Carlo’s Bake Shop, which you might have heard of. It’s a popular Hoboken bakery – made famous by Buddy Valastro via his reality show Cake Boss. 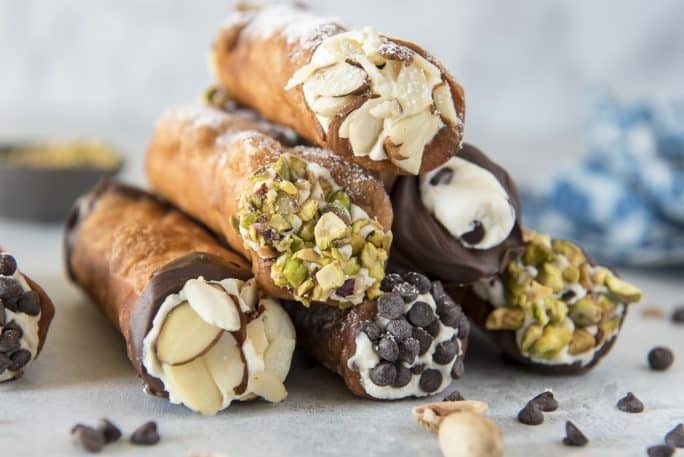 The best cannoli are homemade cannoli. We were given a number as we walked in, and whoa sensory overload. We just kind of gawked at everything while we waited, making our way closer and closer to the sweets. As a cake decorator, I find myself often critiquing confections I see in bakeries, but there wasn’t a flaw to be found on any of them. Shockingly, we only ended up spending about $50. I was expecting a huge bill since that’s how we seem to roll in bakeries. Yet, for that small price, we left with all kinds of different cookies, tiny tortes, cupcakes, eclairs, and, obviously, a few cannolis. After grabbing a couple slices at the New York-style pizza place next door (gazing over the Hudson at the Statue of Liberty while we ate), we got back on the road and left behind the charming town. Out of everything we bought, that amazing Italian pastry was the first thing we devoured. To this day, that will always be my favorite first bite. I did find out that, even as a chocoholic, I don’t really care for an entirely coated shell – but the obsession began. 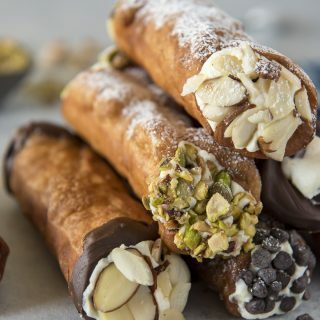 Making cannolis is much easier than you might think! It does take a bit of patience, but the end results pay off in a delicious way. These homemade goodies make fabulous holiday gifts for friends and family. They’ll also surely be welcome on any dessert table! Combine the flour, sugar, cinnamon, and salt together in a food processor. Add the butter and pulse until it resembles small pebbles. Add the egg and cold wine and pulse until the dough just barely begins to hold together. Transfer the dough to a floured surface and knead until smooth, 3-4 minutes. Wrap in plastic wrap and refrigerate for at least 1 hour. Place the egg white in a small bowl and set aside. In a wide pot with a heavy bottom, heat vegetable oil of your choice to between 350 and 380 degrees F. Line a large plate with paper towels. 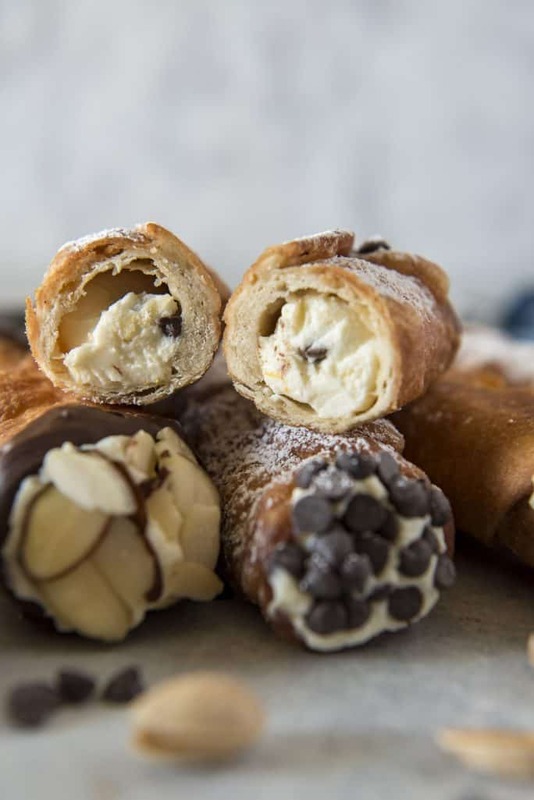 Wrap one oval of dough loosely lengthwise around a cannoli form or 1-inch-diameter wooden dowel. Brush one end of the dough with egg white, then pull the dry end over the top and press down to seal. Repeat with three more dough ovals. Using tongs, carefully lower the dough into the oil and fry until golden-brown, turning them as they fry, 2-3 minutes. Remove the shells with the tongs and transfer them to the paper towel-lined plate to cool. When the shells are cool enough to touch, remove the molds and repeat with the remaining dough in batches until all shells have been fried. Dip ends of cooled shells in melted chocolate if desired, and cool until dry. Fried shells can be stored in an airtight container for a few weeks. The day before making the cannoli, drain the ricotta cheese overnight (24 hours for best results) in a nut milk bag or cheesecloth suspended over a bowl. Place the drained ricotta and powdered sugar in a large clean mixing bowl. Fold together gently with a rubber spatula until well combined. Add the zest and chips and fold until evenly distributed. 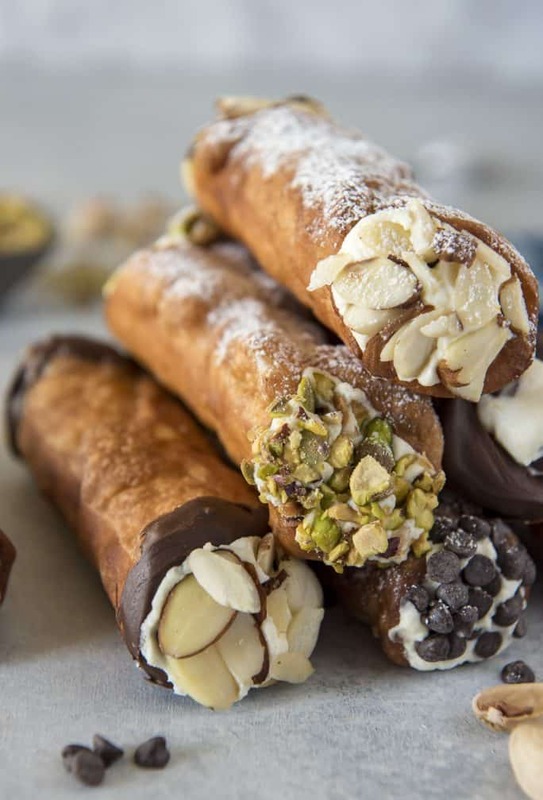 There are a few items that help making this cannoli recipe much easier! And some other delicious treats that can be replicated from Carlo’s! The cannoli filling can be refrigerated up to one day in an airtight container. 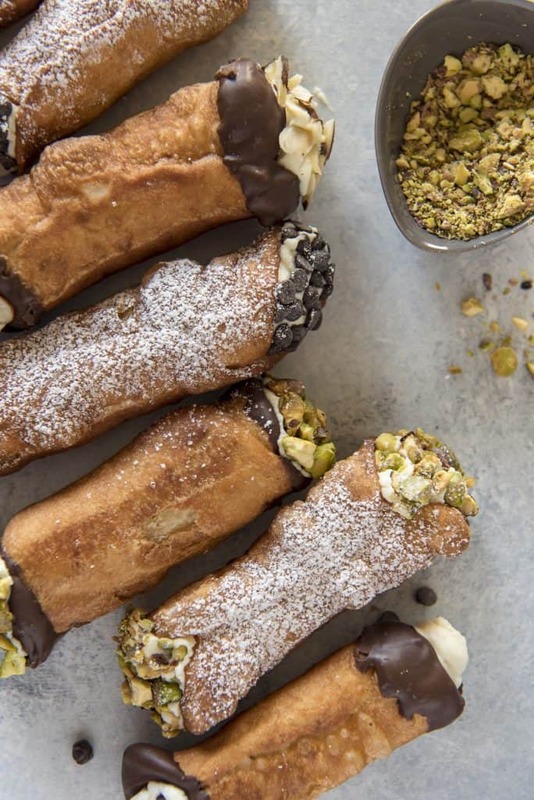 PIN THIS CANNOLI RECIPE FOR LATER! Thank you so much, Linda! I’m so glad they worked out so well for you! Anisette sounds like an incredible substitute, especially for the holidays! Cheers! You didn’t list the ingredients.an how much.lol. You start off with mix the ingredients in bowl..lol. Well, Jeff, you actually scrolled right past the actual recipe card with all that information to leave this comment. Years ago I enjoyed a cannoli in a cute little cafe in Texas. One end of the filling was the “vanilla” Ricotta cheese, but the other end was chocolate. I wonder if you just add cocoa to half of the filling to get it this way? I just made the filling from your recipe and will fill my shells tomorrow. The filling tastes wonderful! Hi Donna! I think a bit of cocoa powder would definitely do the trick, and it sounds like a totally tasty variation! I’ve never had chocolate cannoli cream before, but I would absolutely try it. I hope you loved your finished cannolis – thanks so much for stopping by! Hi, I was just wondering how many servings this recipe has. Thanks! Hi Natalie! 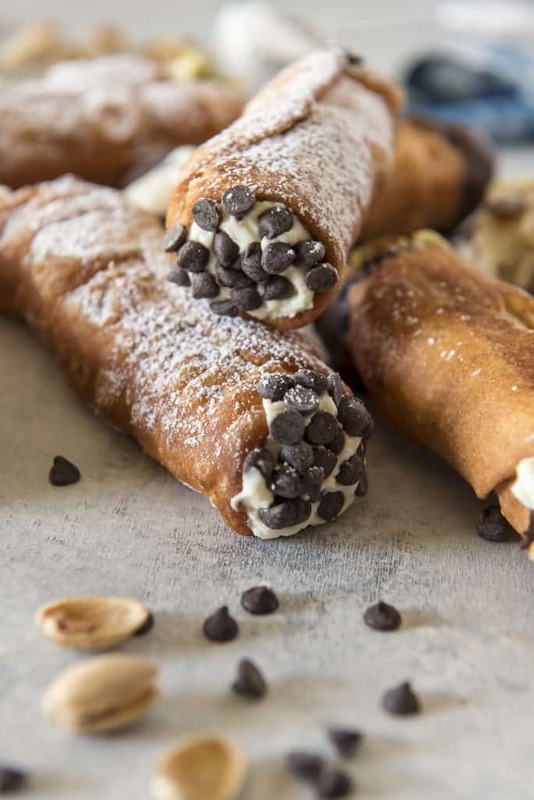 This recipe makes about 12 large cannolis. Erica, it’s really awesome! This will quickly become a favorite in our house!